The restaurant is open all week, but monday ! 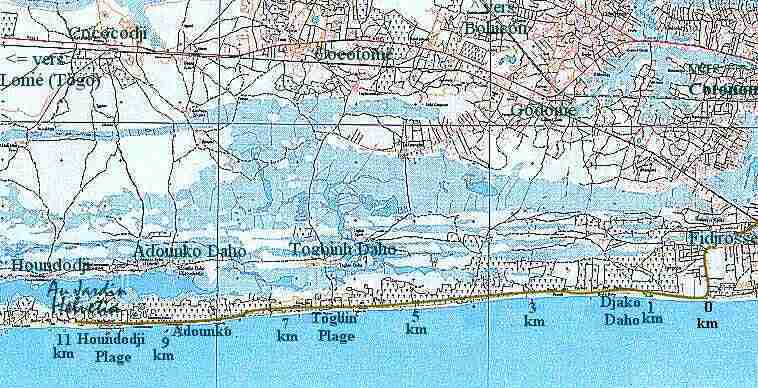 The map shows the coastal region west of Cotonou. At the right corner, one recognizes the Quarter Fidjrossè. From the center of Cotonou Fidjrossè leads a paved street, the Boulevard de la Francophonie, from km 0 exists a good sand road. The Route des Pêcheurs leads along the beach to Houndodji Plage passing by different small fishing villages, like Djako Daho, Togbin Plage and Adounko. On the sand street one can easily drive until Ouidah. From the center of Cotonou (Main Post Office) drive along the Marina (harbour) towards the airport. After the hotel Sheraton (km 5), just before the huge TriPostal center, continue straighton forward in the sand road. After 8,2 km to the north the airport wall, to the south the sea, you reach the end of the Boulevard de la Francophonie (paved street), described above and join directly into the Route des Pêcheurs (km 0). This way is only about 2 km shorter, than the old route, has however substantially less traffic. From the beginning of the Route des Pêcheurs there is exactly 11 km to The Jardin Helvetia always along the sea, towards the west. See the map above. From the center of Cotonou (Main Post Office) drive towards Cadjehoun (water tower) and turn in Cadjehoun in direction of Togo. After about 5 km (of the center), where the railroad crosses (barrier) the street, turn to the left against the west. Follow the paved street for 5 km, Boulevard de la Francophonie, first along the rails, then cross it and at the end of Fidjrossè the street comes to the sea and joins the Route des Pêcheurs (sand route, km 0), afterwards like above. Drive via Boulevard Canada towards the west to Cadjehoun. At the end of the Boulevard Canada in Cadjehoun turn to the right (north), then continue to the railroad (barrier) there turn left, then like above. After the large roundabout (rond point) in Godomé (branching Lomé - Bohicon) drive	to the city. Pass by the large water tower (at the left), the stadium (left) and the Toyota workshop (at the right). Turn here slightly to the right and continue just before the railroad crosses the street (barrier). Here turn again to the right (west). Follow about 5 km the paved street, Boulevard de la Francophonie, first along the railway, then cross it and at the end of Fidjrossè where the paved street arrives to the sea, join into the Route des Pêcheurs (sand route, km 0), afterwards like above. From the beginning of the Route des Pêcheurs drive exactly 11 km toward the west, always following the sea until Au Jardin Helvetia, See the map above. Insiders know the short cut, turning to the right in the long turn left after Godomé, then after approx. 200m crosse the rails and turn to the east (left). Since May 2001 there is a good paved street, which leads along the railways directly to Fidjrossè, into the Boulevard de la Francophonie described above. 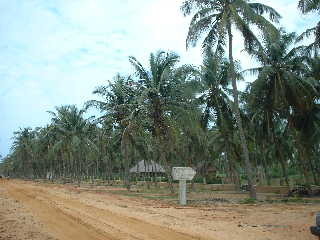 Starting from Ouidah it is possible to drive to along the beach. Turn right (to the south) at the hotel Gbena at the main street and drive through the center of Ouidah. Cross Ouidah completely, always in southerly direction, up to the Port de Nonretour at the sea (after approximately 3 km). Here turn to the east (left), pass by the Jardin de Brésil and exactly after 20 km on the Route des Pêcheurs (sand road), you reach The Jardin Helvetia. If the taxi driver does not know Au Jardin Helvetia, at Houndodj Plage, tell him to go via Fidjrossè to the sea and there on the Route des Pêcheurs 5 km further than Togbin Plage. The costs of hiring a "taxi loué" amount to 1'000 starting from Fidjrossè - Houenoussou (gas station) up to 4'000 FCFA, starting from the center or Akpakpa and 6'000 FCFA starting from the airport, depending upon result of negotiations. With a Zémidjan you will pay about 500 FCFA starting from Fidjrossè - Houenoussou (gas station), from the city centre you pay to Fidjrossè - Houenoussou (gas station) about 400 FCFA, likewise negotiable, but with a fixed fee for the "collecting taxi" of 150 FCFA. The best tip is, always carry a printout of this page (probably in french) with you, so you can give it to the taxi or Zemidjan driver.